The National Bureau of Statistics (NBS) says no fewer than 1,306 Nigerians died in road accidents in the fourth quarter of 2017. The NBS stated this in its “ Road Transport Data for Fourth Quarter 2017’’ posted on its website. The NBS said that 1,200 of the 1,306 Nigerians who died, representing 92 per cent of the figure were adults, while the remaining 106, representing eight per cent, were children. According to the report, 1,019 male, representing 78 per cent died in the period under review, while 287 female, representing 22 per cent, died in road accidents in the period. The report said that 2,489 road crashes occurred in fourth quarter of 2017. It indicated that speed violation as the major cause of road crashes during the period and this accounted for 45.08 per cent of the total road crashes reported. It said that loss of control and dangerous driving by motorists represented 10.08 per cent of crashes recorded in the fourth quarter. 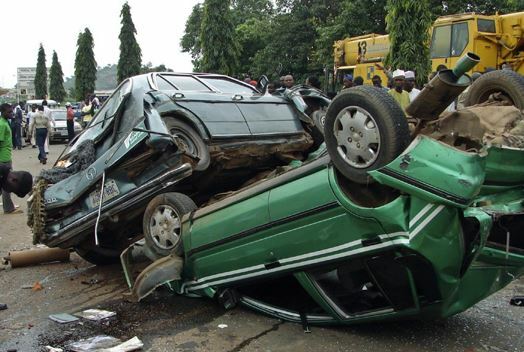 According to the report, a total of 7,349 Nigerians got injured in the road accidents recorded in the period. It stated that 6,855 of the 7,349 Nigerians that got injured, representing 93 per cent of the figure, were adults, while the remaining 494 Nigerians, representing seven per cent of the figure were children. It also reported that 5,366 male, representing 73 per cent, got injured during the quarter, while 1,983 female, representing 27 per cent, were injured within the period. The report said that a total of 214,256 national drivers’ licenses were produced in the quarter. It stated that Lagos and FCT produced the highest number of drivers’ licenses, while Zamfara and Kebbi States produced the least numbers of national drivers’ licenses in the period.